Cassandra Mamone: PEARLS! The only organic gem! PEARLS! The only organic gem! A pearl is a spherical object formed within the soft tissue of a living shelled mollusk. As such a pearl is made up of calcium carbonate in tiny crystalline form, which is deposited in concentric layers. An ideal pearl is perfectly round and smooth, but many other shapes of pearls (baroque pearls) occur. The value of pearls is determined by the luster, color, size, symmetry and the lack of surface imperfections. For many centuries the finest quality natural pearls have been highly valued as gemstones and because of this, pearls have become a symbol as being rare, classic, admirable, and very valuable. Valuable pearls occur in the wild, but they are very rare. Cultured or farmed pearls make up the majority of those on the market today. Pearls from the sea are valued more highly than freshwater pearls. 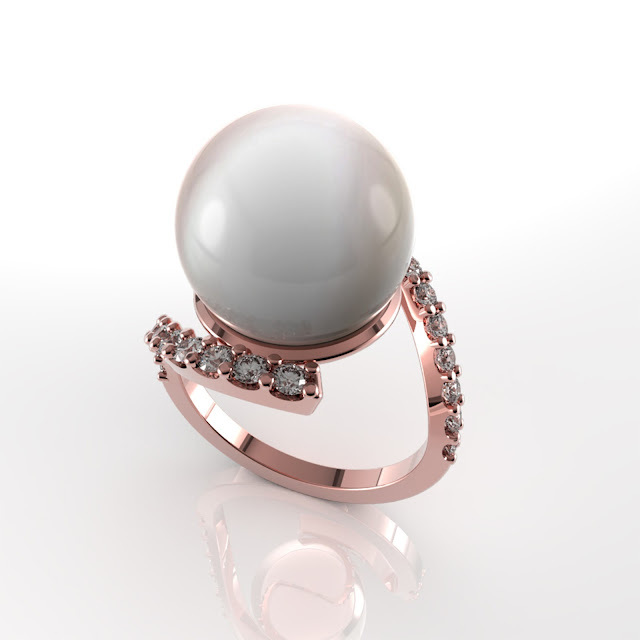 Pearl Diamond ring- 18ct rose gold, white diamonds. The last Egyptian queen Cleopatra prepared a banquet for the Roman leader Marc Antony. At the banquet Cleopatra bet Antony that she could give the most expensive meal ever provided. When the only thing placed in front of her was a cup of sour wine Antony wondered how she would be able to win the bet. At which point Cleopatra removed one of her pearl earrings and dropped it into the glass where it dissolved in the strongly acidic solution, Cleopatra drank it down, winning her bet. Because pearls are an organic gemstone, They are softer and more delicate than other gemstones and precious metals, they can therefore be more easily scratched, cracked, and damaged. Substances such as perfume, hair spray and even natural body oils and perspiration can dull the luster of pearls. It's a good idea, to apply perfume, hair spray, and other cosmetics before putting on your pearls, to minimize the amount of product that comes into contact with the pearls. After wearing your pearls, wipe them with a soft damp cloth to remove any traces of cosmetic products or body oils. Wash the pearls occasionally with a mild soap and a soft cloth, to remove any build-up. To prevent scratches or other damage pearls should be stored separately, away from other jewellery. If possible, store them wrapped in soft cloth, pouch or a soft-lined jewellery box. It's a good idea to have your pearls restrung every so often. Knotting the strand between each pearl will prevent all of the pearls from falling off the strand in the event the strand breaks, it also reduces the pearls rubbing against one another. Hope you found this little round gem, with all it's history fascinating! Girls are crazy about diamond jewelery .Diamond jewelery are really very attractive and stylist.It really very amazing creations.